The clean install acts and performs just like a clean install when booting from a USB drive or DVD of Windows Vista or Windows 7. However, installation was surprisingly faster. Normally, it can take up to an hour for me to perform a clean install of Windows Vista until it boots to the "out-of-box-experience" (OOBE) first time boot screen. In Windows 7, it takes about 20 to 30 minutes for the computer to boot to the OOBE. But with Windows 8, I was at OOBE and up and running after only 14 minutes from start to finish. After booting up in the burned DVD of Windows 8 and running setup.exe, I was first prompted to reboot my PC to continue probably because I didn't reboot after installing some Windows Updates. After I rebooted and logged back in to the desktop, I had to manually kick off setup.exe again. I only had to answer 3 questions and the Windows 8 installer handled everything else. To my surprise, the upgrade was smooth and seamless. I have never, EVER, had a smooth and seamless upgrade from one operating system to another so I was baffled! The installation only took an hour and I didn't have to re-install ANY of my applications or restore ANY of my files from my backup external hard drive. This is definitely a big win for Microsoft in my opinion. Those that want to upgrade to Windows 8 from Windows Vista or Windows 7 will no longer have to worry about re-installing all of their apps and copying back their data from a backup drive to their computer after the upgrade completes. This is a very good thing for everyone. Windows 8 uses the exact same driver model as Windows Vista or Windows 7. As long as there is a driver available for your computer in Vista or Windows 7, you can install the hardware. Windows does a good enough job with finding and installing missing device drivers through Windows Update, but there is still some hardware that isn't detected during installation. An example of this scenario is with my Dell Latitude D630 that had the nVidia Quadro NVS discrete graphics. When I installed Windows 8 on the D630, the ONLY drivers missing were the nVidia graphics drivers. I had to download and install the Windows Vista driver pack from Dell's support site and viola, I had full graphics performance. All other hardware was detected and installed during Windows 8 Setup. Something else worth noting is that it no longer takes 5 to 30 seconds to install a driver for a mouse or keyboard in Windows 8. Windows 8 is now just as fast as Mac OS X Lion when plugging in a USB mouse - it only takes a second or two for the device to register and work as normal! I tried this out with several standard wired USB mice, as well as my Microsoft Explorer Touch Mouse that uses the Microsoft Bluetrack (not Bluetooth) micro USB dongle. As soon as I plugged in that micro USB dongle, the mouse was fully usable after a second. After using Windows 8 for only a few minutes I immediately noticed drastic performance improvements. Basically, everything is faster. Now I don't mean that things seem fast just because a new OS is installed on the computer. I really do mean that things are faster, really fast. Loading desktop applications, transferring and copying files to\from the hard drive, and playing games on Windows 8 is simply faster. I don't know if any of you downloaded and worked with the Windows 7 Public Betas a few years back, but I explicitly remember loading up Windows 7 Beta on a test PC and it was amazingly fast, much faster than even Windows 2000 on a decent, modern, computer. Even after Windows 7 was officially released, Windows 7 is was the speed champion as far as Windows OSes are concerned. But now it is my opinion that Windows 8 is faster than Windows 7. You can definitely tell that Microsoft is not playing around with Windows 8 and they are tweaking and fixing things, making the OS much faster than one would expect. I operate in a dual monitor environment on my work desktop. It is a Dell OptiPlex 780 with an ATI Radeon HD 4550 512mb dual head video card, 4GB of RAM, and a dual core Intel Core i5 processor. Both of my monitors are Dell 19 inch standard square monitors (not widescreen) with a maximum resolution of 1280x1024 per screen. The best feature regarding dual monitors is that Microsoft has finally spanned the toolbar across all monitor windows so I no longer have to install the Multimon 2.1 app on my deskop. Windows 8 also comes with a few very wide desktop backgrounds that span multiple monitors. My laptop has a 1440x900 widescreen display and I had the same experience. All operating system software from Microsoft and Apple is trending to make all applications, features, accessories, or any other type of launchable application appear as a modular "app" accessible from an app icon on your home view. This is much like an app on your iPhone or Android device. The Windows Desktop is no exception to this rule. So in Windows 8, when you want to go back to the desktop view, simply click on the Desktop "app" tile from Start. If you haven't noticed, there is no more "Start Menu" available from the desktop in Windows 8. There is no more Start Button on the task bar and there is no All Programs list. Instead, you must become accustomed to using the new Metro interface and the new "Start" is a part of that interface. Believe it or not, working with the new Start is much easier and much faster compared to the traditional Start Menu from the Windows OSes of old. To be honest, the new Start just makes sense. To get to Start, just move the mouse cursor to the very top or bottom left of the computer screen. A small thumbnail will appear. Click on it to go back to Start. Of course, you could also just hit the Windows key on your keyboard. Search is a BIG part of how to work with Start. If there is an application you want to run, just start typing while Start is displayed on screen. If there is an email that you want to read, or need to find some type of information in a document, just start typing what you are looking for while Start is onscreen. Once you try this just ONCE, you will be hooked. You just cannot screw this up. It's foolproof! Also notice that as you install applications, new app tiles appear in Start just like an application icon or folder would appear in All Programs in the Start Menu in Windows 7 or Windows XP. One would think that the new Start doesn't work well in the business world but I beg the differ. The old start menu in itself has been a problem ever since Windows NT and Windows 95. The old Start Menu is buggy and never worked perfectly, even in Windows 7. This new start in Metro UI is definitely a breath of fresh air and frankly, it just makes sense. You will immediately notice that the desktop view looks almost identical to the Windows 7 desktop except that there is no more Start button (Start Orb) or Start Menu. In fact, EXPLORER.EXE is still the main part of the Windows Desktop experience and EXPLORER.EXE does run as soon as you start up the computer. If you are like me and don't have a tablet PC or touchscreen laptop, you will be working in desktop view most of the time that you use Windows 8. So for those that gripe about the new Start in Windows 8, I say "Who cares!". What I have done is pin my most commonly used applications to the taskbar in the Desktop View. Doing this allows me to stay in Desktop view 95% of the time that I use my Windows 8 computers. Any apps that I need to quickly use, I perform the Windows+R keyboard shortcut to open the Run box and execute a command, or quickly hit the Windows key on the keyboard, type the app or feature name, then hit enter to launch that computer. Hotspots are the key to multitasking with Metro UI in Windows 8. Hotspots are the very top or bottom left corners of the display window. The bottom left gets you into Start, the top left is your app switcher much like hitting Alt+Tab on the keyboard however Alt-Tab only works on the desktop and the hotspot only works with Metro UI. If you have several Metro UI apps launched, such as the Windows Desktop and Remote Desktop, simply move the mouse cursor to the top left of the screen and wait a second for the first app thumbnail to display. Hover the cursor over the app for a moment, and a left sidebar will appear onscreen displaying all of the open Metro apps, including Start at the bottom. So now you know that you work with hotspots in Windows 8 when in either Desktop or Metro UI view and to get back to Start you work with hotspots. Move the mouse cursor to the very bottom left of the display and you will see a thumbnail of Start. Click on that thumbnail to return to Start. It's that simple. Charms is something new in Windows 8 and are quick shortcuts to common tasks while inside of an app. It operates like hotspots, but instead of the left side of the screen Charms are on the right side. Charms are designed to mostly be used while inside of a Metro App, but can be used from the desktop view. They provide high level OS operations like go back to start, search, manage devices, or configure settings. I rarely use Charms in the Desktop view. But again, Charms are not really designed for desktop view anyways. Charms are designed to be used from Metro apps. I like that Microsoft moved Charms to the right of the primary monitor screen where the Show Desktop button in Windows 7 used to be. I never used the Show Desktop feature anyways and the Charm display is now out of my way. The only unfortunate thing in the new design is that the only way to Shut Down or Restart Windows 8 is from the Settings Charm. But, this is just another thing to get used to in Windows 8. RDC is a common application used to remotely connect to a server or desktop computer. Microsoft has provided a Metro app in Start called "Remote Desktop". This is the same app as the classic RDC client but it runs in full screen mode. Unfortunately, I have had issues with the RDC Metro App crashing, or not allowing me to exit from a current RDC connection even after I have logged out. But one good thing about the Remote Desktop Metro App is that it has built-in 'tabs'. The tabs allows you to be able to have multiple RDC connections open at once, then switch between them on demand within the app. Luckily, Microsoft has not taken out MSTSC.EXE from Windows 8. Naturally, I still prefer launching MSTSC.EXE from Run or the Command Line and if I need tabbed views, I still prefer Terminals. The Ribbon being built into Windows Explorer is definitely a breath of fresh air. No longer do I have to deal with trying to find the correct context menu options when I right-click on a file to perform some specific file maintenance tasks. Also, the ISO mounting ability is a nice addition. But Explorer is where Microsoft finally went back to fix some issues. For example, have you ever noticed how long it takes to copy and paste a file from one location to another in Windows Vista? The file would finish copying but Explorer would take a few extra seconds to finish the job and close the progress bar pop-up. This issue happens in Windows 7 too, but performance is a bit better than in Vista. Well, with Windows 8 Microsoft finally 'fixed' the problem and it no longer takes extra time to finish the file maintenance task. The old task manager from Windows 7 and before is just plain terrible. I have been using the Sysinternals tool Process Monitor instead, which basically is a beefed up Task Manager on steroids. Microsoft finally took some cues from that app and made the default Windows Task Manager smarter by adding some of the display features from Process Monitor. No longer do you need to guess what EXE programs are actually running since Task Manager now will show that information. Also, Task Manager incorporates several Administrative Tools into the app such as the Services tab (services.msc), Startup tab (from MSConfig tool), and a tab that shows App History. The new Task Manager is not designed to be a replacement for Process Monitor, but the new Task Manager is finally shaping up to be a useful tool. Why Microsoft never caught on to this in the past I will never know. Yes, I have had several issues over the past week with Windows 8 but to be honest, I think that these issues are to be expected since this is unfinished and unsupported software. The first issue I had was a blue screen of death and was one of the common "nonfault page" BSOD errors. This happened when I had at least 5 different applications open from the desktop and 3 different Metro apps running all at the same time. When I attempted to open a 4th Metro app the BSOD displayed and Windows automatically restarted after a few seconds. However, I have not had a BSOD since and it appears this issue was a one off type of situation. Another issue I had was when I was when I was attempting to install Evernote. I downloaded the EXE from Evernote.com and double-clicked on the installer file but nothing happened. Then, when I attempted to launch Explorer, Windows locked up. I could still move the mouse and strangely I could still go back to Metro UI and I could still launch Task Manager. But when I went back to the desktop, the view was completely locked up. I had to log out then log back in to fix the problem. My final issue that I have experienced was with installing an app from the Windows Store. I started the download for the app, but the download suddenly stopped and went back to the Store app. This had happened to me on several different occassions. But as soon as I attempt to install the app again, everything works just fine. My experience so far has been great. Yes, I have had a few issues but nothing like some of the really really bad problems I have experienced with Windows XP general use or Windows Vista betas. Even though the Windows 8 official release is still several months away, it is clear that Microsoft is on the right track to fixing any remaining issues and finalizing the user interface with the desktop and Metro UI. Personally, I don't mind using the Windows 8 Consumer Preview as my primary OS at work and at home. 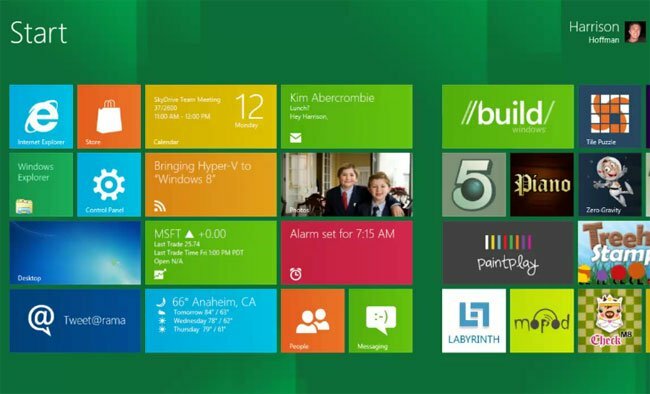 I am already starting to prefer using Windows 8 over Windows 7 even with the new Metro UI. It is simply easy for me to work with the new interface and the fact that Microsoft is forcing me to be a "keyboard junkie" by learning shortcuts and learning how to work around the operating system interfaces makes me like the OS even more. Even at this time, I do prefer using Metro as the Start Menu. While I think Windows 8 still does need some more tweaking here and there, given more development time I'm sure it will be a fantastic product.